Five years and going strong! JazzErie educators Allen Zurcher and Scott Meier, both Ph.D.’s and both on the faculty of Mercyhurst University, are engaged in their fifth year of workshops in area elementary schools. The Workshops are organized by JazzErie with financial support from the Schuster Foundation through ArtsErie. 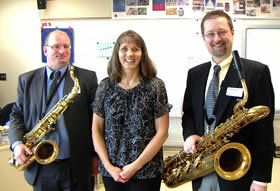 The workshops introduce students to jazz – what it is, its origins, how it sounds, with both videos and live performances by Allen and Scott on their saxophones. The workshops are interactive, with lots of questions and participation by the students in music-making, pitched at the elementary school level (think choruses on “Twinkle Twinkle Little Star.”) They have been greeted with enthusiasm by both students and teachers. In the picture to the right are Allen, teacher Darlene Black from Mill Village Elementary School, and Scott. Overall, about 15 workshops will be presented in four schools. Most participants are fourth and fifth graders, but grades three, six and seven will be visited, as well as one special K class. Content and presentation are pitched to the level of the students. The project is increasingly important as Erie schools, facing ongoing budget woes, continue to cut back on classroom arts programs and curriculum. Workshops don’t make up for lost music lessons, orchestras and bands, but do offer students a quick snapshot of another world out there. This project is part of a larger educational effort by JazzErie to encourage students of all ages to come in contact with the concepts and sounds of jazz. High school students participate annually in JazzErie’s “Next Generation” concert. This year's concert will be scheduled in May (date and location to be announced.) An additional performance in the "Next Generation" series was held at Collegiate Academy in early March, when the visiting Wheaton College Jazz Ensemble was joined by the great area baritone saxophonist Bruce Johnstone. “Next Generation” concerts couple regional high school jazz bands with area mentors, affording them both a performance opportunity and an opportunity to learn from jazz professionals. JazzErie has reinstituted a college scholarship, assisting a student in meeting costs for a college education in music. Performances sponsored and co-sponsored by JazzErie bring all of us in contact with spectacular international talents, as well as regional artists. JazzErie Board members serve as hosts on local jazz radio shows, for pleasure and education as well.. The JazzErie Discussion group, which meets monthly the Erie Art Museum Annex (usually on the third Thursday at 7:30 p.m.), provides an opportunity for sharing and enjoying a broad range of recorded jazz for anyone interested: youth, adults and seniors. 51 YEARS ON THE JOB! Did You Love The Jazz FM Party?